It looks so luxurious and romantic! 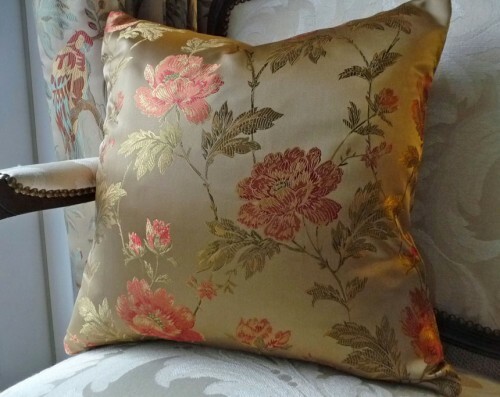 Here’s one of the many silky, iridescent, floral cushions coming out in my spring pillow line. Every time I walk past this one I have to reach out, touch it and admire the shimmering woven flowers. You can make it your own handmade treasure here. This fabric, “Swank “ comes in 4 colorways (green pictured) and can be found in the Private Residence Book. I have lined it, although it has a thick, rich hand and at 62 inches wide it would be ideal for pleated drapery panels and even light use upholstery with12,000 Double Rubs. My daughter loves it too which surprised me as I expected that this would appeal to the ‘more mature’ homeowner… in appreciation of traditional classics. Suggested retail is $55 per yard. This pillow cover is sample priced at $49. Maxwell Fabrics, a “For The Trade” supplier located in Vancouver Canada, is one of the hardest places to tear myself away from. It is my favorite showroom to visit for my drapery clients and even more so to select fabrics for my new collections of decorative pillows and throw cushions. 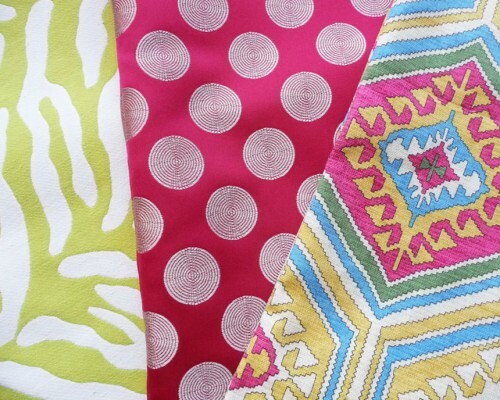 Rolls and rolls of dreamy fabrics on my cutting table are calling my name so I better get back at it. By the way… here is a sneak preview of more throw cushions ready to be photographed! What do you think?